Backmatter includes more information about Bell’s inventions, a timeline of his life, a bibliography, and sources for further learning. Mary Ann Fraser is the author and illustrator of over sixty fiction and non-fiction books for children, including No Yeti Yet (Peter Pauper Press), Heebie-Jeebie-Jeebie Jamboree (Boyds Mills Press), the Ogg & Bob books (Two Lions) Ten Mile Day(Henry Holt), and several titles for The Let’s Read-and-Find-Out series, including Where Are the Night Animals (HarperCollins). She lives in Sunnyvale, California. From an early age "Aleck" (Bell's family nickname) evinced an interest in sound and hearing, probably due to his father's profession of speech therapy and his mother's hearing loss.Aleck's childhood experiences, observations, and experiments led to his careers, first as a teacher to the deaf and then as an inventor of the telephone. Aleck was determined to speed up communication and improve on the telegraph, first developed in the 1830s. The book's accessible text focuses on his life up to and including the invention of the telephone in 1876, when he was 29. His later inventions are described in the backmatter, along with a chronologyand an author's note. The multimedia illustrations use photographic collage elements, friendly, slightly cartoony human figures, and sound effects and dialogue balloons on some pages. Photographic insets and diagrams further explain Bell's work. 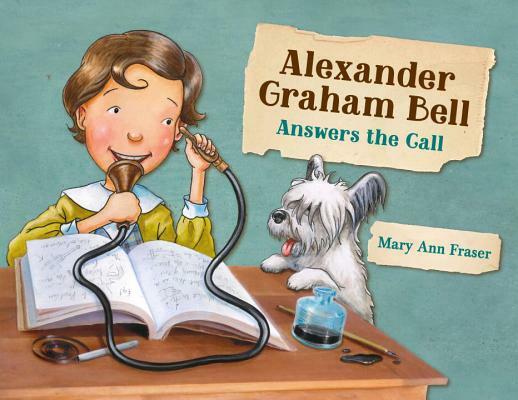 This expands the content of the book and makes it appealing to both children looking for the story of Bell's life and his lifelong curiosity and those more interested in scientific explanations. However, it lacks a bibliography. The front and rear endpapers are of particular note, depicting a photographic history of the telephone from 1876 to 1989 in sepia tone. The author's note describes Aleck's interest in photography and her own desire to incorporate photography in different ways in the book's design. Calling out to history buffs and scientists, this will inspire young inventors. A look at the inspiration behind Alexander Graham Bell’s most noteworthy invention, the telephone. The book reveals much about Bell’s personal life and the driving force behind his inquisitive nature. Bell’s mother, Eliza, had lost most of her hearing as a child, and his father, Melville, was a speech therapist; young Bell is shown here contemplating how sound works and learning the two-handed manual alphabet to communicate with his mother. Many important events, including the collaboration between Bell and Thomas Watson, are conveyed in the form of a story, which makes the facts easy to digest for younger readers. Fraser’s multimedia artwork recalls Bell’s passion for photography, with some scenes resembling a snapshot. Text boxes are peppered throughout, giving readers more detailed explanations about how the ear works, the age of invention, and more. An author’s note and further information about Bell’s inventions are appended. VERDICT Recommended for biography collections serving elementary school students.